Having a remote SHTF Bug-Out camp equipped without an axe would be about as silly as trying to drive a car with only three wheels mounted on it. Something in the accomplishment of the tasks at hand would come up short. Now of course there are endless types, styles, weights, and models of axes. In reality a well-stocked camp might have several different types on hand for different jobs. 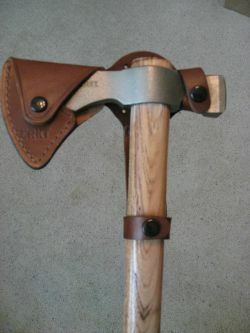 I have found a lighter weight tomahawk style axe to be very handy around the alternate hideout camp as well as the home place for a variety of tasks. The tomahawk version of the axe I have been using with very pleasing results is the CRKT Woods Chogan T-Hawk made and assembled by/for the Columbia River Knife and Tool Company out of Oregon. This tool was designed by Ryan Johnson with a history of making such tomahawks for nearly 25 years. He brought this particular design to CRKT in 2013. 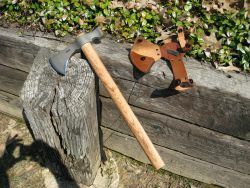 This Chogan T-Hawk is a Woods Chogan model designed for those needing a handy everyday axe for a variety of jobs around camp, home, or recreational use. 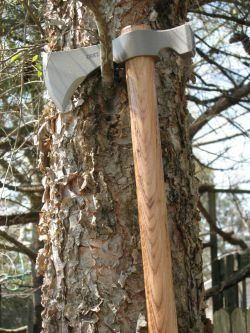 It’s intended uses includes trimming limbs, or small trees such as for clearing a campsite, chopping split wood into small strips for campfire kindling or wood stove use. 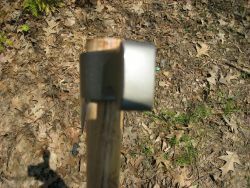 It is not a heavy duty weighted axe for chopping camp wood or falling trees. This CRKT T-Hawk’s axe head is hot forged from 1055 carbon steel at 50-55 Rc into a solid head. The main and secondary edge bevels are ground flat for cutting through camp wood timbers. The axe head has also been formed with a hammer head useful for hammering nails, tent stakes, shaping metals, fencing work, or similar tasks. The handle on the CRKT Woods Chogan is a fine piece of Tennessee hickory known for its stability and durability. It is seal coated with a lacquer finish which though adding longevity to the handle, results in a pretty slick grip. In my practical uses of this axe I have resorted to the use of good leather gloves for a secure grip. I am contemplating adding a wrap of double-sided sticky black tape, which I have supplemented on a variety of slick handled tools. This seems to work well in providing a very firm, non-slip grip. I still suggest you wear the gloves. When I bought the CRKT T-Hawk from the A. G. Russell knife store either I had a momentary lapse of reason or just overlooked buying the fine snap on leather sheath that goes with the axe. If you buy both at once, the rate is cheaper than buying the sheath later as I did. It is well worth the extra $13 for the protection it offers the edge and axe head. Frankly I don’t have use for a really serious axe at my Bug-Out backup camp. We are either removing downed trees with a gasoline chain saw or a gas boom saw but never with an axe. Our main campfire wood is bought already split or we use round logs from chain sawing jobs. However, I use the T-Hawk for handy trim out jobs around the cabin or the property, which is used primarily for hunting every season. 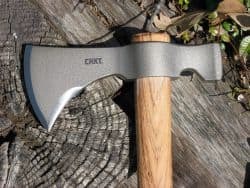 Having a swing tomahawk with a good sharp head like this CRKT Chogan has been handy to trim away encroaching bushes, to cut away limbs and branches around the bases of hunting stands, gate posts, and other structures on the place. A couple of easy chops takes out most saplings in quick order. Always be mindful of where and how you swing this blade. More than many times I have found the hammer head on this tool very useful. When you own an aging cabin with lots of wood stairs the nails on step planks are always easing out. All I have to do is catch my boot on one once, and I’m reaching for the Chogan T-Hawk to pound it back down. The CRKT T-Hawk with the sheath can be carried on your pants belt, but I don’t like to do that. The snaps on the sheath can be a bit cumbersome to release or lock snap back down when it is worn on the belt. I prefer to keep my tool lashed on the rack of my ATV for quick access. Maintenance wise this tool is like any other. It is not stainless, so it will rust if not taken care of properly. After each extended use I wipe it down with a good oil, which is my case is usually a good gun oil. If the metal has become spotted or tarnished, I will brush it down with some coarse steel wool coated with the oil. Likewise the leather sheath will need some attention like any good blade sheath. I oil the snaps regularly and occasionally brush them out with an old toothbrush or a small wire brush. I try to wipe the leather itself with a soft cloth, maybe with just a little saddle soap if it has gotten dirty. I am not a big fan of using oils on leather because they change the color and sometimes weaken the texture of the leather. You may be a better judge of that. All in all, I can handily recommend this CRKT Woods Chogan T-Hawk. 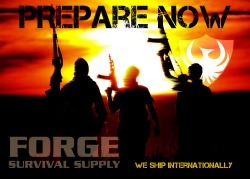 This tool fits a lot of SHTF requirements. If you need a handy, lighter, long wood handled axe/hammer tool/weapon, then look into this one. Pick one up on Amazon today.